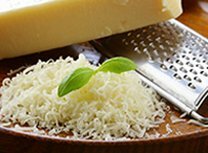 Parmesan cheese is a hard, granular cheese made from skim cow’s milk. It is fruity and nutty in taste. Typically, grated parmesan is used to dress up a soup or risottos.